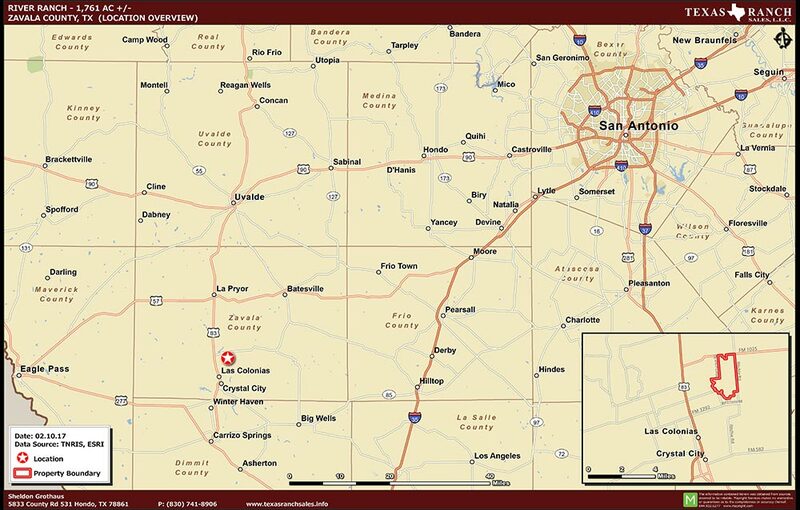 Located in Zavala County, outside of Crystal City, about 2.2 miles East of Hwy 83 and fronts on FM 1025. 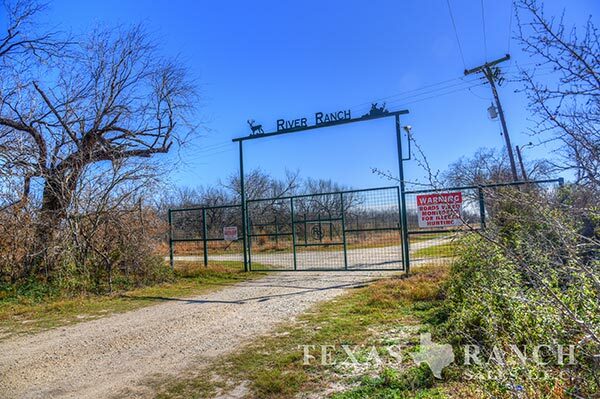 The River Ranch is extremely diverse and has a tremendous amount to offer to any hunter, rancher or outdoorsman. It is conveniently divided into 3 pastures. The north high-fenced pasture is about 610 acres, the south high-fenced pasture is about 640 acres, and the southwest low-fenced pasture, which is along the Nueces River, is about 511.5 acres. Covered with various native grasses, brush and cactus, which provide great forage for much of the wildlife and cattle. It has a good mix of brush, fields and senderos along with an ample supply of water. The water on this ranch is outstanding. Over 3.5 miles of the Nueces River, which is the border for the southwest part of the ranch. Two Carrizo wells equipped with 25 hp pumps with both wells having a 22,000-gallon+/- storage tank. A beautiful 4+/-acre lake, which is stocked with bass and blue gill, is directly in front of the main house. Numerous ponds located throughout the ranch ranging in size from ¼ acre to 1 acre and several water troughs. All of which have water piped to them and a valve at each location to control the water. 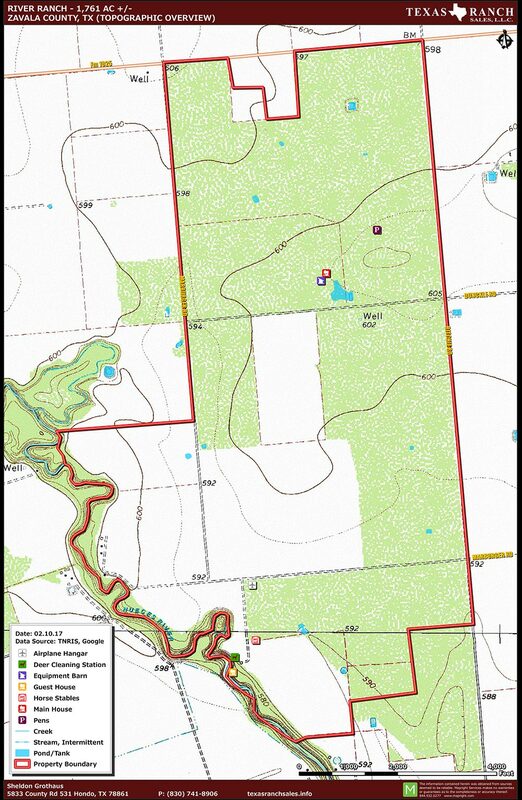 Also conveyed with the ranch is 202+/- acre feet of water rights from the Nueces River. There are several food plots, 4 that can be irrigated in the high fence pastures. Over the past decade the current owner has been managing the whitetail deer herd and has brought in an extensive amount of high-end genetics, which has produced some phenomenal deer. The ranch is currently under a Level 3 MLD permit. It is also home to an abundant amount of turkey, dove, quail, hogs, and a few red stag deer in the south pasture. There is a nice 2,200+/- sq/ft ranch style home built in 2005. The home has a great porch and consists of 4 bedrooms and 3 baths with an enjoyable rock fireplace in the living area. A guest house/lodge overlooks the Nueces River, which is known as the Tree House. It is 3,200+/- sq/ft, 2 bedrooms and 1 ½ bath. The tree house has a new metal roof, windows and drop ceiling. A 3,000+/- sq/ft metal barn is handily located next to the main house. There is a 10,000 +/- sq/ft air plane hangar, a 7 stall horse barn, and a deer cleaning station with walk-in cooler located on the low fenced parcel and close to the tree house. A set of cattle pens is located in both the north and south pastures. Several blinds and feeders are scattered throughout the property. The north high fenced pasture has a full deer breeder facility with 7 deer breeder pens and the south pasture has 4 deer breeder pens. No deer are currently in the pens. Seller will convey no minerals. This ranch is a property for anyone interested in hunting, ranching or wildlife management. The seller will consider dividing the ranch and selling the pastures separately.